Own Nisekoi False Love Season 1 - Part 1 Episodes 1-10 Blu-Ray from Deff, DVD, Blu-Ray & 4K Video Specialists - Free UK Delivery..
Own Nisekoi False Love Season 1 - Part 2 Episodes 11-20 Blu-Ray from Deff, DVD, Blu-Ray & 4K Video Specialists - Free UK Delivery..
Time flies and Raku still cannot recall the girl who has the key of his pendant... Could it be Marika, the new student freshly arrived in his school? Against all expectations,Chitoge does not stand that other girls hand around Raku... It seems like she has feelings for him after all. Every student is getting ready for the end-of-year show and Raku was chosen to play the part of "Romeo" but so far, nobody yet who will play "Juliet"... M..
Own Nisekoi False Love Season 2 - Part 1 Episodes 1-10 Blu-Ray from Deff, DVD, Blu-Ray & 4K Video Specialists - Free UK Delivery..
One boy, many girls: several possibilities... Who has the key that will open the gates of his heart? What's next for the false lovers Raku and Chitoge?... Could they become a real couple? When Chitoge finally accepts her feelings for Raku everything becomes even more complicated: will her love be reciprocated? It was so much easier when they were pretending! And true to his nature, Raku still doesn't know which girl he prefers. The situ..
Own Nisekoi False Love Season 2 - Part 2 Episodes 11-20 Blu-Ray from Deff, DVD, Blu-Ray & 4K Video Specialists - Free UK Delivery..
One boy, many girls: several possibilities... Who has the key that will open the gates of his heart? Seasoned heart breaker Raku unintentionally seduces Kosaki's little sister who unlike her older sibling is not at all shy and has no problem pestering her beloved with amorous gestures! The young man is unable to fend off the girls' advances and in turn incurs the wrath of Chitoge. 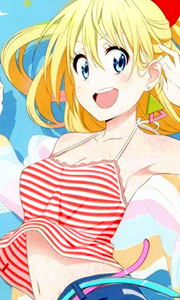 However behind her demanding exterior Chitoge is sentime..